Nadav Nirenberg: Streetlight Manifesto: New Album/Tour! Streetlight Manifesto has a new album coming out 11/6 called "The Hands That Thieve". There will be no lack of high, loud trombone... In all seriousness I'm proud of the new album and excited to share the new tracks. It's by far the most ambitious, intricate recording that I've been a part of...to call the parts epic would be an understatement. 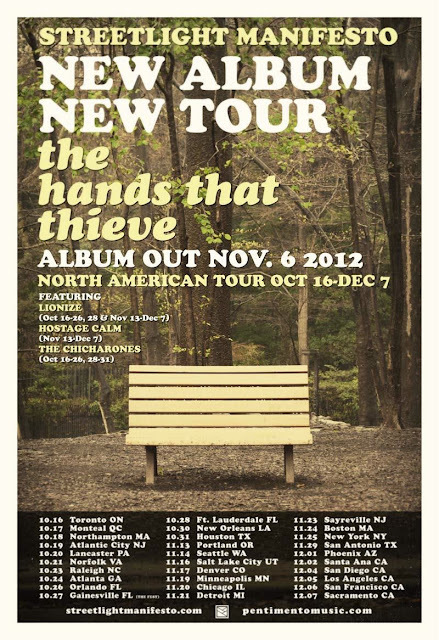 The Hands That Thieve will drop smack in the middle of our upcoming tour (while we're on our "break" to hit South America). We'll be hitting a lot of familiar spots around the US with old friends Lionize (nice) and new friends from Portland/Warped Tour "The Chicharones". The Chicharones are a rock solid live hip-hop band, extremely talented and all great guys. We'll also do some dates with punk rockers Hostage Calm. It's gonna be a good one!